How many levels of processes do we need? Depending on the level within the process hierarchy, an activity might be as grand as “Design product” or as small as “Verify drawing”. There are several Activity Levels. 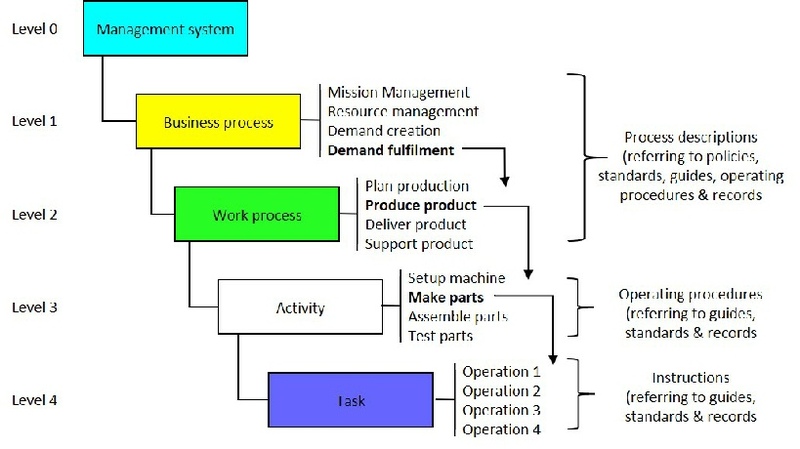 If we examine this hierarchy in the Demand Creation Process the result might be as follows:A Level 1 Activity might be “Develop new product”. If we view this activity as a process we can conceive of a series of activities that together produce a new product design. These we will call Level 2 Activities. A Level 2 Activity might be “Plan new product development” If we view this activity as a process we can conceive of a further series of activities that together produce a new product development plan. These we will call Level 3 Activities. A Level 3 Activity might be “Verify new product development plan” If we view this activity as a process we can conceive of a further series of activities that together produce a record of new product development plan verification. These we will call Level 4 Activities. A Level 4 Activity might be “Select verification record blank” Now if we were to go any further in the hierarchy we would be in danger of noting arm movements. Therefore in this example we have reached the limit of activities at Level 4. Another convention might be to simply categorise the levels as Process, sub-process, sub-sub-process, sub-sub-sub-process etc but it might create some confusion in conversations. From the above diagram process descriptions would be desirable at levels 1 and 2 but no further. It may be more practical to define resources in any detail at level 2 and simply include a summary at level 1. It is better not to duplicate information as it creates problems in its maintenance.